Please note that we are only able to supply this resource to Ofsted / Estyn registered schools and nurseries in England and Wales, to independent schools, and to international schools and nurseries outside of Great Britain. Due to publisher restrictions, Little Linguist is not currently able to supply this product in Scotland. 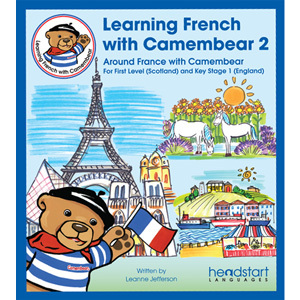 Continuing from the foundations of Learning French with Camembear 1, this fun and engaging resource takes our friend Camembear on an adventure around France, where the children will not only learn more about the French language but will also learn about the culture and see the sights. Learning French with Camembear 2 is a very comprehensive and flexible resource to introduce new core language. It has been tailored to meet all Key Stage 1 curriculum requirements, including a new innovative phonics methodology with Nadine Chadier. Aimed at 5 - 7 year olds, it can either be used as a follow-on resource to Learning French with Camembear 1, or can be used as a starting resource for children having some knowledge of French already. This fantastic comprehensive and flexible resource introduces new core language that has been tailored to meet all First Level and Key Stage 1 curriculum requirements including a new innovative phonics methodology with Nadine Chadier (Education Consultant and MFL trainer). Through the three main story books, Camembear will take the children on a cultural journey around France the to develop their range of literacy skills including speaking, phonics, listening, reading, discussion and thinking skills. DVD for the three stories "À Paris avec Camembear", "Camembear va en Bretagne" and "Camembear va en Provence"
Why use Camembear to introduce French in your nursery / infant school? The Learning French with Camembear (LFWC) pack has been developed as a very user-friendly programme - you don't need to be a specialist of French to deliver this. The structure is designed so staff can learn with the children. One member of your staff will become the "Camembear Champion" and they will co-ordinate the training of other teachers / practitioners (a training DVD is supplied in the pack) and organise the delivery of French into the nursery planning. You don't need to bring in a French specialist to do the teaching; it can be done in house with the current practitioners and teachers. LFWC supports early learning goals and Ofsted requirements. The programme complements and enhances the teaching of the whole EYFS curriculum. Through links to other curriculum areas, the programme encourages practitioners to bring the new language to life and make it meaningful. Camembear really motivates children to speak French. Children are generally more confident speaking to a puppet in French than to another person, and will be reassured by being taught by practitioners they already know. LFWC is a very flexible, creative and enriching scheme that will complement what you do already in your setting. When learning numbers in English, why not use Camembear to reinforce numbers in French too? Camembear becomes part of your team and part of your learning culture at nursery. He can be used to enhance daily rituals for example, greetings, reinforcing good manners, or even asking for snacks at snack time – all can be done in French with Camembear. Learning French with Camembear 2 is suitable for introducing French to young children from approximately 5-7 years old. It can either be used as a follow-on resource to Learning French with Camembear 1, or can be used as a starting resource for children having some knowledge of French already. It is a suitable resource for both specialist and non-specialist teachers. Please note that we are only able to supply this resource to Ofsted / Estyn registered schools and nurseries in England and Wales, to independent schools, and to international schools and nurseries outside of Great Britain. Due to publisher restrictions, Little Linguist is not able to supply this product in Scotland.